The Honey Comb Quilt top is done! I finished it up at Retreat this past month. I got my hubby to help and get a quick outdoor photo. We have wind so this is a good as it got today. At least the colour shows off best in the outdoor light. I am very happy with how it has turned out. 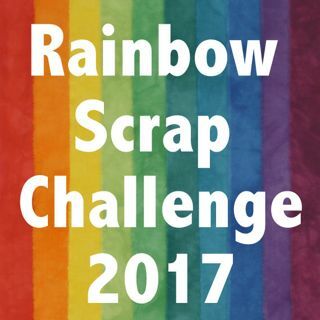 I started it with the Rainbow Scrap Challenge 2017 about this time last year. We were to dig in our scraps that were multi coloured or dark. Well I had a few scraps to work on. I sort scraps by colour and many of these prints did not fit in to a colour box. I will add this post to Soscrappy on Saturday when she puts up her link page to Scrap Saturday and the Rainbow Scrap Challenge. The indoor photo at retreat, late at night after everyone else is gone to bed. Retreat was Great! I also got a NCW done. What? NCW Necessary Clutch Wallet. I made this one with gold Vinyl and the KFC prints. I was given a large box of vinyl and just had to make something with it. Now on to other vinyl colours. Inside there is some hand dyed gold and pink fabrics. 2 zippers and pink card slots. So happy with this wallet. One of our guild members is moving and had a Garage sale today. I had to go. I got 2 books for $5 each. Then a large scrap bag behind the books. I also found her batiks she was selling. good deals and I did not go crazy. I also got some free fabrics to make some dog beds and stuffing to put in them. I guess I need to make some more beds. Your time at the Retreat was nicely productive. I like your honeycomb quilt and the garlic knot you posted about previously. I always find so much inspiration in other's RSC posts. Thanks for visiting my blog, and your thoughts on the chicken fabric. fantastic filmsy Cathy. That pieced border book looks very exciting, and that collection of batiks holds lots of potential especially for a quilt artist like yourself. That Honeycomb looks like fun! I adore string quilts and that's a really interesting twist! Admiring your garage sale loot - a big pile of future fun! Great deals at the Quilter's Yard Sale and the Honey Comb top turned out beautifully!! Well done. What a beautiful quilt you made! A steal of goodies at the moving sale too. Lucky you. That wallet is adorable - and very functional. Great job.